As soon as the sun rises from behind Hohe Munde peak the scenic Seefeld Plateau is ready for a dreamlike winter day amid picture-book landscapes. Majestic summits and gently rolling hills covered all in white make for a fantastic backdrop. Truly varied landscapes of awesome natural beauty are typical for the Seefeld Olympia Region which is renowned for its infinite range of winter sports and activities for all ages and preferences. Seefeld is the plateau's main resort, ranking among Tirol's most attractive and beautiful holiday regions – no ifs, no buts! A charming mountain village coupled with international flair awaits you in Seefeld. Among the village's highlights are the pedestrian area in the romantic center, top-class accommodations and made to measure offers for families. Playing golf, walking, hiking, active days – but also rest, relaxation, recreation and other holiday pleasures. A summer vacation in Seefeld stands for an infinite variety of mountain summer adventures. Majestic mountain tops within the Karwendel Alpine Park await passionate mountaineers. Exciting and more leisurely tours are scheduled on walking routes and theme trails – e.g. the Route of St. James or the Eagle Walk offering picture-book views of the Alpine scenery and giving deep insights into the country's nature and culture treasures. Some 60 serviced mountain huts and quaint inns invite hikers to enjoy a rest stop and a hearty snack. 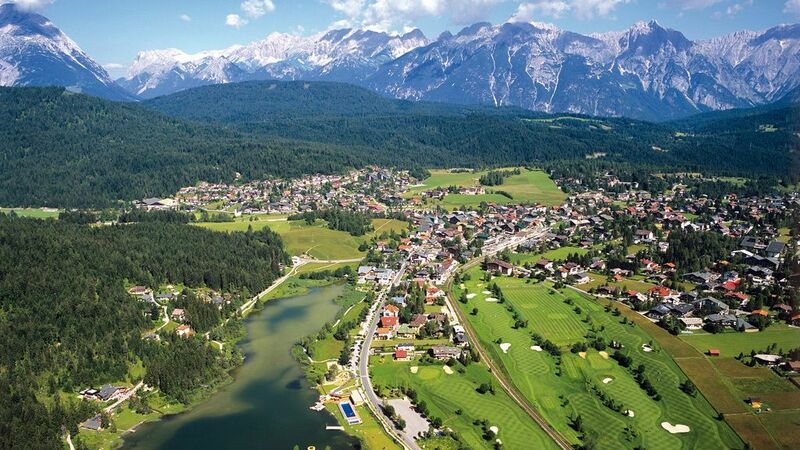 The ultimate golf courses in Seefeld rank among Austria's most beautiful golf areas thanks to the idyllic landscapes of Seefeld's high-altitude plateau. The Seefeld Wildmoos 18-hole Golf Course nestles amid a picture-book wooded area, while the Seefeld-Reith 9-hole Golf Course can be found right in the village center of Seefeld – between lake Wildsee and Gschwandtkopf slope. Thanks to its convenient location snow is always guaranteed in Seefeld. The charming resort offers loads of winter sports and activities for young and old. On sunny days nature explorers enjoy the marvelous winter landscape on endless walking trails in Wildmoos or Neuleutasch. A well-deserved rest stop and a hearty snack are strongly recommended – for example at quaint Wildmoosalm. Pleasant moments in abundance. Two winter activities are the undisputed highlights in Seefeld and its scenic surroundings: Alpine skiing and cross-country skiing. The entire Seefeld Plateau region makes a unique paradise for Nordic skiing fans, offering an incredible Nordic skiing network of 279 kilometers. The two lovely ski areas in Seefeld – Rosshütte and Gschwandtkopf – are small but very nice. The region boasts 48 immaculate slope kilometers and some 30 mountain lifts suitable for both advanced skiers and families. Children are especially welcome in Seefeld: the made to measure kids' ski area on Geigenbühel slope is just perfect to get in touch with snow sports for the very first time.